Single Metric Widgets can be added to white label PDF Reports, Client Dashboards and Marketing Dashboards to create a colorful high level summary or comprehensive dashboard of the marketing metrics most important to each campaign. Client Dashboards can have 1 page of single metric widgets per campaign, Marketing Dashboards and PDF reports can have multiple versions of single metric widget pages because they are constructed in a modular, multi-report manner. After a widget has been created, you can click the gear icon (top right) to access the widget settings. Click the bars icon in the top left to drag to drag and drop the widget to a different position in a multiple widget report. The metric number in the center (e.g., 6.68 in the above example) is the data for the last date of the report. The Trend Chart data is based on the Frequency Filter setting and Trend Chart Date Range selection. Metric number is the data for the same date of the previous month. The % is the change between the metric data for the last date of the report period and data for the same date of the previous month. The % is the change between the metric data for the last date of the report period and the data for the same date last year. 1. Add Metric button launches the metric settings screen in which you can select everything from data type to color and features to be displayed. 3. Separator button allows you to insert a separator bar, with or without a title, in order to organize the display of widgets into logical groupings. 4. Remove All Metrics button deletes all metric widgets from the page. Before using that, we caution you to consider if you may need to access those widgets again, and if so, create a Preset first (refer to 6 below). 5. Date Range can be adjusted for the data that you want to view on this screen. The date range that displays in Client Dashboards, Marketing Dashboards and PDF reports will be determined by the settings in those tools. This is what a widget page can look like after a number of widgets have been created. In this screenshot, we've explained how the settings and features are labeled. 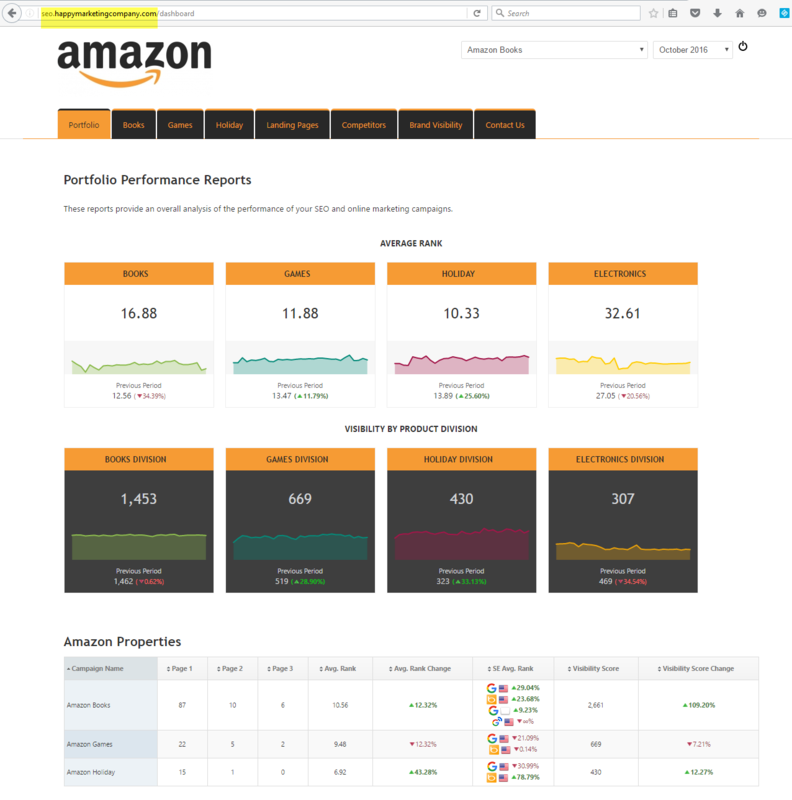 This marketing dashboard was built with a variety of single metric widgets. As demonstrated, it is possible to have multiple widgets of varying colors and themes on a page. Certain SERP metrics also have options to display data either by the average number of occurrences per page or as a percentage. The Metric Name you enter displays across the top of the widget and you have the option to show or hide the Trends Chart, Previous Period Value, Previous Year Value, and Change between current and previous dates. If you're placing multiple widgets on one Web Dashboard screen or in a PDF report, you can drag and drop each widget into the order you prefer. Click the Add Metric (or if you have an Enterprise package then you may also choose the Add Cross Campaign Metric button), or you can expand the Report Options section of the screen and add a Custom Report Title and individual Metrics. Click the Add Metric button to create a Single Metric Widget for the campaign that is displayed in the upper right of the screen. 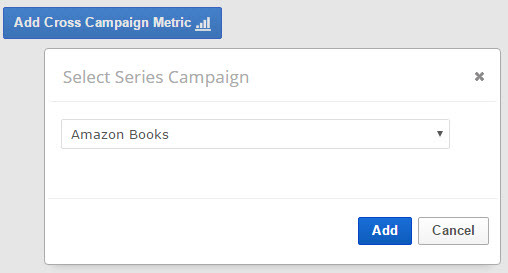 If your account has an Enterprise package, you can click the Add Cross Campaign Metric to add a metric associated with a different campaign, and then select the campaign. Select a Data Source and Metric. Domain: the primary campaign domain or one of the additional websites (e.g., competitors) added to the Websites screen in campaign settings. Search Engine: choose from any of the search engines tracking in the campaign. Keyword Tags: select individual or all Tags and filter for keywords that Contain at least 1 selected Tag (OR) or Require that all selected Tags (AND) meet the Average Rank Rules you select below. Results: filter Rank results by Top 10, Top 20, etc. Average Rank Rules: If you want Average Rank calculated differently than actual rank, then enter a Rank Threshold number. Rank Value enter the value you want Rank Ranger to use for keyword rank that is higher than the Rank Threshold you've chosen. Keyword rank value will then be calculated based on the number you set in the Rank Value field. Enter 0 if you want the keyword ignored completely when calculating average rank. Leave the Threshold at 100 and Rank Value at 0 to have the actual rank value used in calculating Average Rank, this is our default method. Enter a Name for your metric for the label that displays across the top of it. 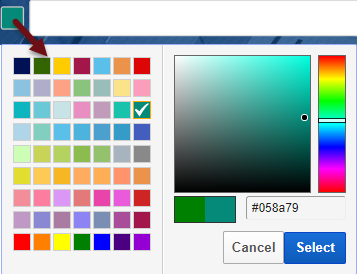 Click the Color Selector to change the color of the Trends Chart. Compare Display: is available when Previous Period is set to Show. Select Previous Value, Change or both Previous Value and Change. Theme: select the theme design you want for this widget. Click the Save button when you have finished making all your selections. Separators span the width of the page and can be used to add a title to a section of Single Metric Widgets or to insert a page break for display PDF reports. When you have finished working on the Single Metric Widget(s), you can easily add your creation to a White Label Scheduled PDF Report or Marketing Dashboard page by hovering over the gear icon and selecting the desired option, and then select the date settings you want used in the PDF or dashboard. Open the Graphs & Widgets > Single Metric Widget screen and select the Campaign (upper right corner menu) you want the widget to display in. Create one of more Single Metric Widgets and then expand Report Options, hover over the Save As icon and select Save as Default for Client Dashboard. Open Campaign Settings > Client Dashboard and check the box for Single Metric Widget and click the Save button.